LEAD and OFLD are proud to announce the following candidates seeking their LEAD certificate. The Coordinator of the L.E.A.D. (Laity Empowered for Active Discipleship) Certificate Program, in conjunction with the Office of Formation and Leadership Development, is proud to announce the following candidates seeking their L.E.A.D certificate. 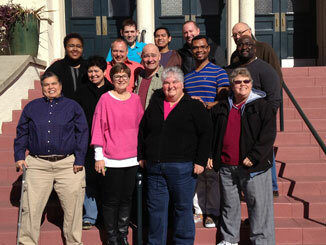 These lay people from across the USA met in Los Angeles, CA for three days at the fourth USA L.E.A.D. Retreat, where they learned more about the program, the current and future role of laity in MCC, and their individual spiritual journeys. By the end of their time together each participant had created an “Action Plan” to better equip themselves as lay leaders, not only in their local church, but in the denomination at large. Each participant will work with the coordinator or a mentor and their local church pastor to bring their plan to life. Guest presenters for the weekend were Rev. Dr. Nancy Wilson, Rev. Dr. Mona West, Barry Hundley and Phil Griffin. A special Thank You to the congregation of Founders MCC, Rev Neil Thomas, Rev Melissa Smithee, Rev. Stedney Phillips, Phil Griffin and the marvelous people who prepared food each day. The next two L.E.A.D retreats (which is required of all participants) are scheduled for February 2013 in New Castle, UK and June 2013 in Chicago, IL (before General Conference). If you would like to know more about the program and how you can apply to be in the next class, please reach out to the coordinator, Barry Hundley- or Marina Laws – . Please keep these eleven lay people and their 50 brothers and sisters from across North America and Australia in your prayers as they journey to be better leaders and work toward certificate completion.